The sound is basically just music, so it can be turned off and the video can be used like an automated PowerPoint presentation; it would work well with teacher-provided lecture content. The animated graph of Arctic ice minima is compelling and important, but underplayed in the video - it is only shown briefly. So instructors may want to stop the video to talk about it. NASA satellite imagery of different types of natural ice on Earth (glaciers, sea ice, mountain snow/ice cover, etc.). 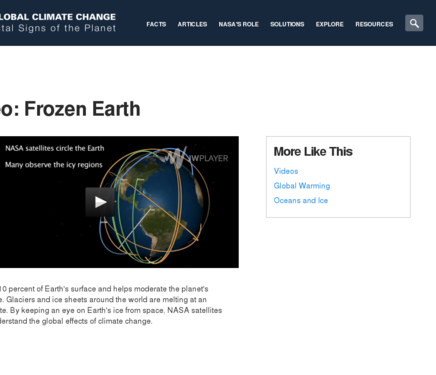 Animations of global ice cover and of the varied NASA satellites that track ice cover. Comment from expert scientist: It broadly covers the different "forms" of ice found on the planet. Visually stimulating. Uses engaging NASA images of all types of ice features. Some of the imagery is false color, which is not explained; teachers will have to do some homework to field students' questions about these pictures. Some others (like blue ice glacier calving fragments) are natural color and are also not explained or highlighted. Teachers will want to review the video before using to be certain they know what kinds of images are being presented. Images are beautiful and of high quality.